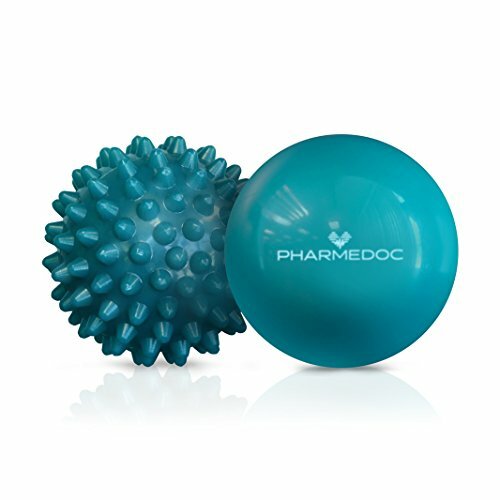 Body soreness, muscle pain, stress, tension, tightness -- loosen it all up with the PharMeDoc Massage Ball Set. Choose between either a hot or cool compress with your massage so that you can stimulate blood flow while immediately easing muscle pain. Massage duo made with firm rubber bears heavy weight and deeply massages into large and small muscle groups. Use the smooth ball for kneading out knots or use the spiky ball to dig into multiple trigger points. Place in hot water (no microwaving) or freezer for warm or cooling relief with your massage. Being the smallest of the self-myofascial massagers, the massage ball (also known as the lacrosse ball) is the most effective at isolating specific tight muscles. The reason why they're so popular is because they mimic massages you get from a therapist without the heavy price tag. Perfect for anyone who needs to loosen tight muscles and ease pain for recovery. Compact size allows you to use body movements to apply comfortable pressure. Helps with recovering from an injury, assists in soothing plantar fasciitis or sore feet, eases glute pain, loosens tight hips, relieves shoulder stress, alleviates forearm pain, and more. Small size travels easily with you from the office to the gym and home, or even during vacations. Our massage ball set's unique thermo-technology can safely be used hot/cold for warming or cooling relief to your muscles.